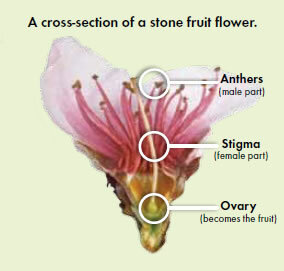 Many fruit trees require another variety of the same fruit type to help pollinate the flower in order for it to produce fruit. For instance a ‘Golden Delicious’ apple needs either a ‘Granny Smith’, Jonathan’, ‘Red Delicious’ or a ‘Red Fuji’ nearby in order to produce fruit. Nectarines, peaches and apricots are largely self-fertile and do not require another type to produce fruit. Those fruits that do require a pollination partner need to ensure they are paired with a same fruit type that blooms at the same time which is why pollinating friends are so specific.